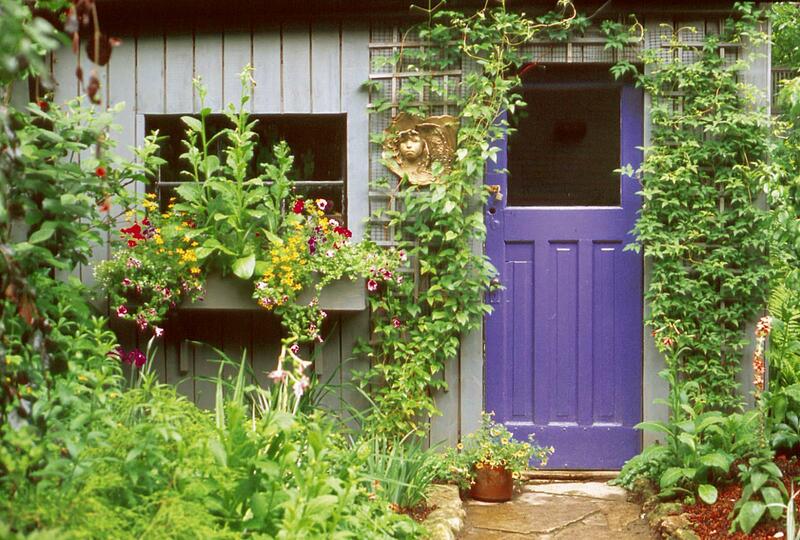 A gardener sensitive to blue's accent power painted this door. Close your eyes for a moment and clear your mind. Imagine if you will, the colour blue. Can you describe your vision? Is it aqua, turquoise, navy, sapphire, azure or cobalt? Consider a little further, imagine a field of bluebells, a clump of steel-blue fescue, or perhaps a shallow pool reflecting the sky. Do you feel yourself starting to relax? Whether you use blue as an accent plant or a theme colour in your garden, the results will produce a myriad of colour-inspired moods. Most people find the colour blue to be soothing and restful. Blue inspires patience. Colour therapists believe blue can lower blood pressure and pulse rates. It is said to quiet the mind, encouraging meditation and calm. Studies have found blue to be the favourite colour of deliberate, conservative people. Colours are difficult to put into words. It would seem the English language is lacking when we try to accurately describe the ever-changing moods of colour. Blue can be clear, soft, deep, rich or melancholy, but these descriptions still fall short of the full scope of this cerulean colour. Surroundings also alter our perception of colour. Colours appear the most true when placed next to grey or white. Walls, fences, nearby shrubs and companion plantings all affect our perception of blue plants. Given their soothing, healing qualities, it is not surprising that blue-themed gardens are so popular. Achieving a successful mix of blues can be a challenge however. In planning such a garden, we would be wise to heed the advice of Gertrude Jekyll from her classic book, Colour Schemes for the Flower Garden: "My own idea is that it should be beautiful first, and then just as blue as may be consistent with its best possible beauty." A splash of white (lilies for example) and lemon yellow (such as Coreopsis verticillata 'Moonbeam' or Hemerocallis 'Citrina') planted among a bed of predominantly blue flowers and foliage plants, such as hosta, is refreshing. Blending pastel pink, white, lavender, purple, silver and blue will create an impression of serenity and calm. Cool colour combinations seem to fade into the background, making a garden seem more spacious. (Bright, warm colours jump forward, making a space feel smaller). Orange appears opposite blue on the colour wheel, making it blue's complementary colour. You may remember this little test from science class. Stare at a piece of orange paper for a minute or two and then quickly shift your gaze to a sheet of dark green paper. The green will appear to turn bright blue. A few orange flowers planted among a bed of blue will make the blue appear more intense. This theory was proven to me this summer. In a predominantly blue garden filled with Delphinium grandiflora 'Blue Elf', Veronica spicata, Lavender, Festuca glauca 'Elijah Blue' and Hilictotrichon sempervirens (Blue Oat Grass), a couple of nasturtiums (with gentle blue/green foliage) had been planted to climb a wooden obelisk in the centre of the garden. Given the hot, dry summer the nasturtiums were slow to establish themselves and I had nearly forgotten about them. By early fall, their cheery orange faces began poking through my blue planting (apparently, they were not inclined to climb up the obelisk). My first reaction was to eliminate the orange, it seemed to shriek for attention. And yet, this glimmer of orange seemed optimistic amid the intense blues of the garden. Was it the cooler air and softer fall light or the orange blooms that brought this garden to life? Probably all three factors were important. Carefully placed, blue toned plants are indispensable in the garden. Like white and silver filler plants, blue can be used to blend and soften bright colours in a mixed border. Several years ago, I made an impulse purchase of several decadent peach-coloured bearded irises. Placing them to best advantage became a challenge in a predominantly pink and blue border until I realized that my Johnson's Blue geranium bloomed along with my iris collection. The following spring, several blue irises, the peach iris and a colony of the geraniums were planted together. Softened by companion planting of blues, the peach iris shone for their brief moment of glory. Spiky blue Veronica spicata, planted among vibrant daylilies, have the same calming effect in the July border. Blue, the favoured colour of poets and gardeners, offers healing, refreshment and calm to the garden, and to the soul. Theresa Forte is a garden columnist, photographer and garden consultant based in Niagara Falls, Ont.